Marco Rubio-Donald Trump: The GOP's new man of the moment tries to take down the front-runner. He better win. Marco Rubio Is Finally Ready to Fight Donald Trump. He Better Hope He Wins. You’re playing with fire, Marco. 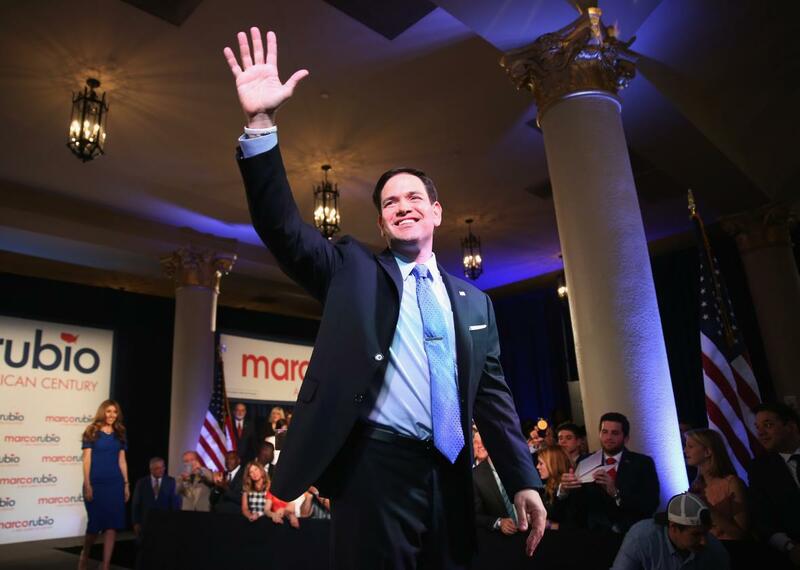 Above, Sen. Rubio waves to supporters at the Freedom Tower on April 13, 2015 in Miami. Marco Rubio has been taking a slow-and-steady approach to the 2016 race. During the summer of Trump, that meant holding his tongue while the Donald turned the GOP nominating contest into a knockdown, drag-out battle royale that’s been heavy on personal attacks and light on policy. But following a second strong debate showing last week—during which Rubio flashed what passes for foreign policy expertise among the GOP field—the Florida Republican finally sounds like a man ready to fight. Baited into a fight or not, Rubio better know he’s playing with fire. Yes, Trump looks relatively weak at this particular moment. He stumbled during last week’s GOP debate. His lead in the polls is shrinking. And the political press appears more eager than ever to finally bury his campaign. But if there’s one place Trump excels politically, it’s using a slap fight to his advantage—just ask Lindsey Graham, Rick Perry, Scott Walker, Bobby Jindal, and Jeb Bush. Still, Trump’s no longer undefeated. Carly Fiorina has proved it’s possible to tangle with Trump in the center ring and emerge stronger for it. If Rubio continues to attack and succeeds, he could finally restore establishment order to a chaotic race. If he fails, he risks giving Trump exactly the fuel he needs to jumpstart what looks like a stalled campaign.